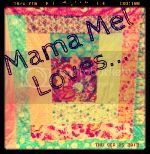 Mama Mel Loves...: I'm back! Hey, everyone! Just a little note to say I am starting back in the bloggy world! Yaaay! I have A TON of comments to catch up on, so bear with me. I will get back to all of you! After a week of migraines, my husband got sick, then proceeded to give me his illness! Ugh! We both had the flu shot in early September, but haven't had the H1N1 shot yet. We went to the doc to make sure there were no pigs around here... Luckily, I tested negative for all types of flu, and strep. So, even though I felt flu-ish with a fever, apparently it was just a bad cold (or some strain of flu unknown to doctors... Hmmm...). Weird! Anyways, we are all better, and I am very happy that my son didn't get what we had! That would have been triple-y bad! So, I will be posting tomorrow starting back on my Muffin Tin Mondays! :) Have a great week! Welcome back, good to hear you are feeling better. glad to have you back, mel! cant wait to blog with you! I'm glad you are feeling better, and welcome back! So glad everyone is feeling better. I'd almost rather have the flu than a week long migraine! Welcome back. And from what I was told AH1N1 can spurn false negatives when one gets tested. Or so my nurse neighbor told me. Either way glad your back! OMG..YOU WERE GONE ..WHEN I WAS GONE TOO!!! ..LOL! I am so glad to hear you are feeling better! Welcome back!